Well, for the next 30 years after Sir James’ passing, Raymond and his older brother Kevin carried the Kirby torch forward. They kept building the increasingly wide range of Kirby corporate initiatives, battled through some tough challenges as the Australian economy went through vicissitudes and the regulatory environment for business kept changing, and built a large, highly successful group of companies. They were true to the core principles established by their father: application of latest technology, quality and safety, commitment to training a skilled work force, and loyalty, always, to staff. 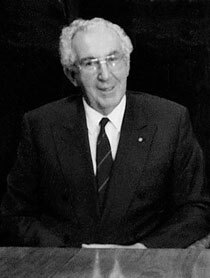 Raymond was a leader in the Metal Trades Industry Association (MTIA), the Confederation of Industry, the Australian Manufacturing Council, the CSIRO Advisory Council, and the Australia-Japan Committee. He also chaired a major Inquiry to Review Productivity and Innovation Programs for the Commonwealth Government, which set the tone for the extent of Government’s role in technology advancements during the 1980s. He was a long-time member of Sydney Rotary, and also served for 16 somewhat turbulent years on the NRMA Board. All this, as well as being Managing Director of the Kirby Group of Companies! From 2002 – 2012 as Chairman of the Foundation, Raymond “carried on the torch of life” for his generation, and nurtured the next generation as well. As we track Raymond’s continuing contributions and guidance of the Foundation in that decade, we see yet again his strength of leadership, his steadiness and his distinctively wise judgment — just as they have been displayed throughout his working life. Secondly, it is also apt in that “A Quality Journey” truly reflects not just Raymond’s business career, but his approach to family life and to his range of sporting and other interests. And thirdly, and perhaps most of all, the autobiography provides an apt and marvellous gift to present and future generations of Kirby family members. It tells the story of an interesting, varied, generous, achieving, giving and loving life. This story is a family treasure. Well, those of us who have been privileged to serve on the Board of the James N. Kirby Foundation have always admired the way in which Raymond has provided practical perspectives and advice in terms of grant determinations and areas of worthy concentration. This has always been the case – and it was particularly admired the way in which he seamlessly took over the chairmanship when his brother Kevin passed away, and the manner in which he has encouraged, supported and nurtured members of the next Kirby generation as they have enthusiastically committed themselves to the continuing mission of the Foundation. Sir James, and Kevin too, would be so delighted to know that when Raymond retired as Chairman in 2012, the Foundation was distributing grants of around $1 million annually — notwithstanding the challenging investment climate of the last several years. In 2012, Raymond decided that it was time to step down as Chairman and from the Board of the Foundation, and all of his fellow Directors and other close associates have mixed feelings about this. He is the one surviving member of the Foundation’s foundation board. And we shall miss him. But he feels that this is the right time, and we know that he will be showing keen interest in the Foundation’s future progress year by year. He will be pleased to watch how the Kirby custodians – Michael, James, Margaret and Helen – absorb greater responsibilities in their roles.